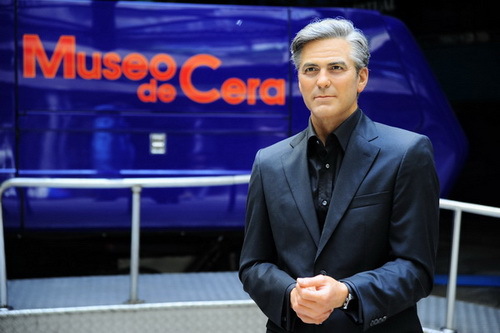 The Museo de Cera, or Madrid Wax Museum, was inaugurated on the 14th of February 1972. It is located on the Paseo de Recoletos street, at one corner of the Plaza de Colón, and at the start of what is known as the "golden mile" of Madrid Museums. The museum is comprised of an area of 2,000 square metres split over two floors; it has over forty rooms in which the visitor can travel back in time accompanied by the corresponding historical figures. Thanks to the combination of different spaces, environments, lights and sounds, each person represented takes on a special dimension in time. The exhibition is being constantly updated, and contains representations of the most prominent figures of recent times: George Clooney, Brad Pitt, Angelina Jolie, Andrés Iniesta, Penélope Cruz, Antonio Banderas, Barack Obama, Rafa Nadal, and Mario Vargas Llosa are just some examples. Many of these contemporary figures have personally inaugurated their sculptures, and some are even dressed in clothes from the real person's personal wardrobes; for example Montserrat Caballé, Rafael Alberti, Zinedine Zidane, Mario Vargas Llosa, Rafa Nadal, Iker Casillas and King Juan Carlos I. The spectacular sets, made by the best artists, are home to the figures and, combined with the Museum’s other attractions like the "Terror Train", "Simulator" and "Multivision", help ensure that visitors enjoy hours of fun and discovery.